When time is tight and you need to get dinner on the table asap, reach for this recipe. 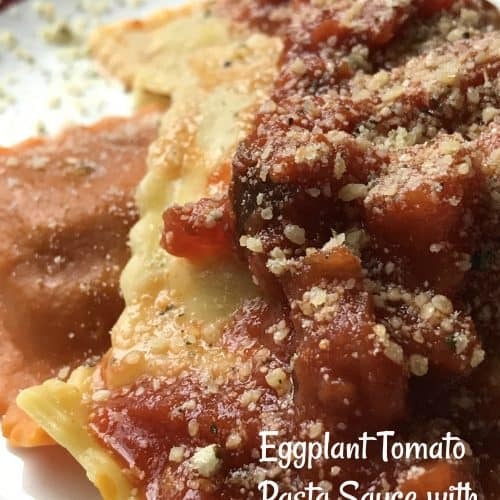 Eggplant Tomato Pasta Sauce is a simple, rich and delicious pasta sauce. The perfect sauce to spoon over your favorite pasta. This sauce can be made in under an hour. This will give you enough time to prepare a fantastic dinner. Add a garden salad and a loaf of garlic bread, super! 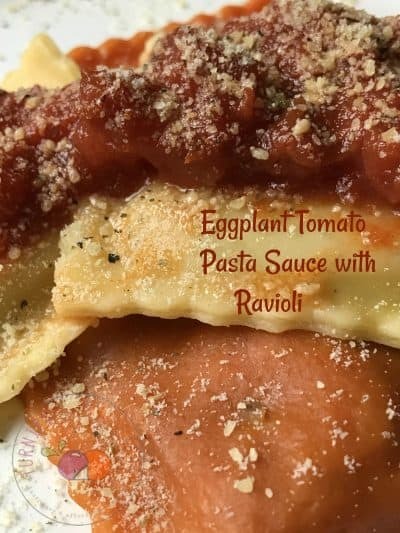 Two types of ravioli is used in this recipe. I picked up one package of each; turkey cranberry ravioli and bourbon sweet potato ravioli. The two types went together extremely well. Priano is an exclusive Aldi brand with emphasis on Italian-style products. The Aldi stores in my area have underwent some major remodeling recently thus making the aisles wider and the store layout easier to shop. 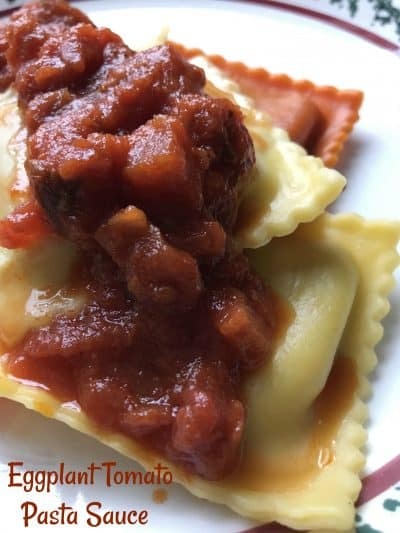 Turkey Cranberry Ravioli is perfect for this time of year and the perfect accompaniment to this simple yet tasty sauce. 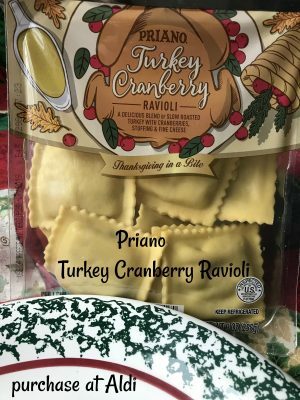 According to the package, “Turkey Cranberry Ravioli is a delicious blend of slow roasted turkey with cranberries, stuffing and fine cheese. Thanksgiving in a Bite” A 9-ounce package of ravioli was under $4.00 and can easily feed a family of four, along with a salad and loaf of garlic bread. Bourbon Sweet Potato Ravioli is also perfect for this time of year and perfect with this simple sauce. The ingredient list, listed Bourbon as an ingredient. I’m positive that you’d have to consume a large amount of ravioli before you became drunk! That being said, I’m sure that it’s safe for children. The label states that bourbon sweet potato ravioli are “A savory blend of bourbon, sweet potatoes and fine cheeses.” I concur. Makes a Great Meal, Anytime. Serve turkey cranberry ravioli and bourbon sweet potato ravioli together. 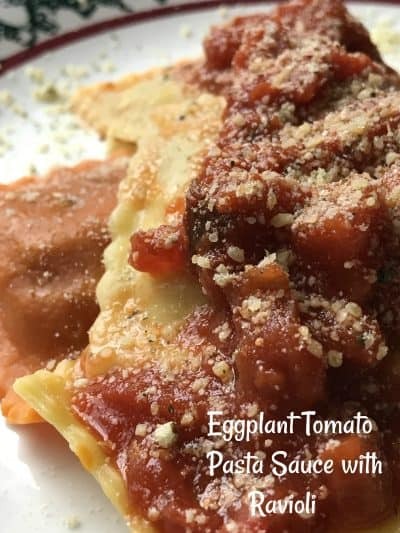 Top with eggplant tomato pasta sauce for “Thanksgiving on a Plate.” Make this simple and inexpensive eggplant tomato pasta sauce anytime to top ravioli or your favorite pasta. Another possibility would be to serve warm sauce with crispy slices of garlic bread. Rich and delicious, this is a great standby simple pasta sauce. Heat 2 tablespoons of olive oil in a large frying pan, then add the eggplant, sprinkle with one teaspoon of salt, fry over a high heat until golden on all sides. Spoon the eggplant onto a plate. Add the remaining 2 tablespoons of olive oil to the pan, then add the onion, garlic, remaining salt and water. Boil until the water evaporates and the onion starts to turn golden, about 10 -15 minutes, add the tomatoes and bay leaves and simmer over medium high heat for about 15 to 25 minutes until the juices evaporate to a thick sauce. Stir in the vinegar, wine, tomato paste, sugar and cayenne pepper and simmer for five to 10 minutes until thick again. Add the eggplant, stir well. Season with salt and pepper to taste. This sauce keeps well in the refrigerator for up to 3 days. Can be stored in the freezer for up to 3 months. Cook ravioli in boiling salted water according to package directions. Drain. Serve cooked ravioli with eggplant tomato sauce and sprinkle with parmesan cheese. Like Sweet Potatoes? So do we, give these recipes a try and hopefully you’ll love them as much as we do. Sweet Potato Bake, Sweet Potato, Goat Cheese and Cranberry Rounds and Sweet Potato Sweetie Pie Bars. 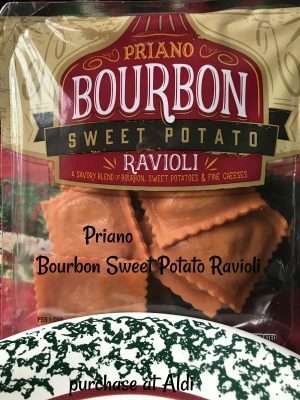 *Side Note: If you have questions pertaining to the amount of bourbon used in the Bourbon Sweet Potato Ravioli, contact Aldi.